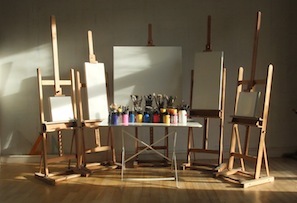 We organize a series of weekly art classes from Monday to Friday, 9:00am to 17:00pm in our own studio. They are destined for those eager to paint (even a large scale work) or those seeking instruction in the art of “trompe-l’oeil”. The subject and the style of work are of your own choice (figurative or not, inspired from a photograph, reproduction of painting etc…). A preliminary meeting will enable us to understand your aims, to discuss the project and the different technical issues. A relaxed lunch is held daily around the table d’hôte. Each participant will bring their own picnic; tea and coffee are provided by the host. The cost of the course, including the supply of materials is 300 €. These courses take place several times a year. Anyone who can write can draw! Unfortunately however for most of us drawing stops when we learn to write. We can sketch a tree, the sun, a house, in the same way we did at the age of 7 with the conclusion … “but I cannot draw!” It is not essential to know how to draw to be able to paint. With personal advice and methods adapted to your own needs, Jean Marc leads you to (re)discover your talents as a painter. The strokes and movements are liberating… gradually increasing in complexity and gently the painting takes form.